Every June, hundreds of people head to the Kennebec River to paddle with a purpose. One of those paddlers is 15-year-old Tristan Bouchard of Farmington. He’ll be there early, volunteering to help direct traffic. Then he and his family will hit the river for the Paddle for Pine Tree Camp. Tristan started coming to Pine Tree Camp when he was in elementary school and Tristan’s Terrific Team has been paddling ever since. Before they hit the water, he loves being part of the volunteer crew. “If somebody has on an orange vest and a radio, that’s what he wants to do,” said his mother, Amy. The impact of the Pine Tree Camp experience is what motivates Tristan and his family to get involved. Then he starts counting down the days. While at camp, Tristan enjoys spending time with his best friend, Nicholas, who he sees every year. He looks forward to driving the boat and having the chance to use the camp’s two-way radios with Nicholas. His passion for Pine Tree Camp started when he was just six-years-old. He inspired a Hop-N-Ing at his elementary school and he and his classmates donned bunny ears and hopped in the gym – raising thousands of dollars for the camp everyone knew Tristan loved. Pine Tree Camp opens its doors to anyone who can benefit, regardless of their ability to pay. No camper is ever turned away. 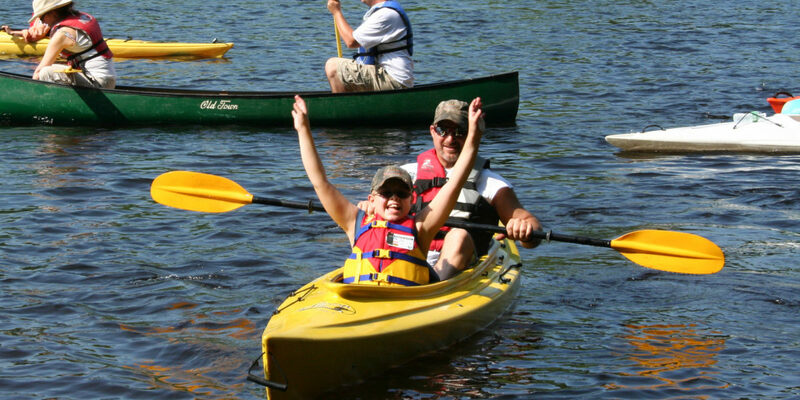 Funds raised from the Paddle for Pine Tree Camp keeps the camp’s open door policy firmly in place, allowing camp staff to focus on making sure campers are actively participating in activities like hiking, playing basketball, kayaking, fishing and camping in tents under the stars. All things Tristan and Nicholas enjoy together every summer.